LOTTE XYLITOL Dental Health Gum breaks the age-old myth that chewing gum is bad for your teeth. In conjunction with proper toothbrushing and regular visits to the dentist, chewing sugar-free gum maintains good oral health because it promotes the production of saliva that helps remove food debris stuck in your teeth. When I was still a kid, my dentist would give me a sugar-free gum after a grueling treatment to my teeth. I needed to chew the gum to aid in stopping the bleeding. But I never knew that there is a gum that can do a whole lot more for our oral health until I learned about the product being presented at the Lotte Xylitol press launch held at the Hotel Intercontinental on March 4, 2010. Trying the product first hand makes the big difference! 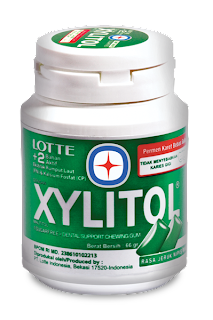 Xylitol, the active ingredient in LOTTE XYLITOL, plays an important part in this process. A natural sugar sweetener derived from birch trees and the fibers of many fruits and vegetables, xylitol is considered “tooth friendly” as it aids in the prevention of cavities. This natural sweetener is used in a multitude of products. It has been developed in Europe as an alternative sweetener for people with diabetes and hyperglycemia. It is widely used in many Finnish confectioneries and other sweets from different countries. Aside from confectioneries, xylitol is also commonly used in gums, including dental health gums such as LOTTE XYLITOL, for which it lends its oral care properties. For 10 years, LOTTE XYLITOL has been in existence in other Asian markets, most notably, in Japan, China, and Korea, where it has gained significant inroads into the gum market. More recently, it had likewise entered the consumer markets in Taiwan, Thailand, Indonesia and Vietnam. Here, in the Philippines, Lotte Xylitol is the first dental health gum to use xylitol as an ingredient. But how does LOTTE XYLITOL promote good oral health? Right now, there are bacteria called Mutans Streptococci in your mouth. The growth and metabolism of these bacteria lead to the formation of dental plaque. Mutans Streptococci absorb the sugars and carbohydrates from food and drink and metabolizes them into lactic acid. Lactic acid decalcifies or mineralizes the tooth enamel, making it vulnerable to decay. Here is where LOTTE XYLITOL comes in. Xylitol, unlike sucrose, cannot be metabolized by bacteria. Without sugar to metabolize, bacteria in your mouth cannot produce lactic acid. Sugar-free LOTTE XYLITOL, which uses more than 50 percent xylitol as sweetener, effectively prevents the buildup of dental plaque and cavity. It is okay to chew dental health gum! With regular intake of two pellets, four to five times a day, LOTTE XYLITOL is a perfect partner to toothbrushing and dental visits. As a testament to its role in good oral health, LOTTE XYLITOL is the only dental health gum in the country that currently bears the Philippine Dental Association’s Seal of Recognition. LOTTE XYLITOL’s alliance with the PDA extends beyond just the Seal of Recognition on its labels. LOTTE XYLITOL sponsored the celebration of the 6th National Dental Health Month last month, where the dental health gum was part of regional kick-off events in various provinces, after the National Kick-off held at the Quirino Grandstand. Related topic: The Power of Three: Complete Dental Health. Nice post about Chew Lotte Xylitol for good oral health, in these days food allergy is more common and people have to try to be careful with their health for example, I unfortunately spend much money in buying generic viagra only because I need it.